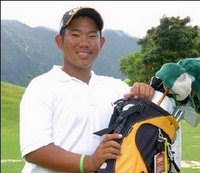 Tadd Fujikawa, 16, from Hawaii made his professional debut at the Reno-Tahoe Golf Open, shooting an unimpressive 78. He made the cut at the Sony Open in January, making him the youngest player in 50 years to make a PGA Tour cut. Last year, at the US Open at Winged Foot, he was the youngest player to ever play in a US Open. His first round as a pro included two holes with double-bogeys. He admitted to being accustomed to the deep rough. Fujikawa still plans to finish high school where he is about to begin his junior year and attend college. Only 5'1", he was born 3 1/2 months early. Steve Flesch took control of the first round of the Reno-Tahoe Open shooting a 9-under 63. 0 Response to "Fujikawa turns pro"